Nothing can beat that feeling of holding a new baby in your arms, so small but perfect in every way; their whole life in front of them with endless possibilities. I was fortunate enough to have this experience again at the end of September when my new niece was born – the beautiful Georgia Alyssia, sister to Emilia Rose. I couldn’t resist this cute little outfit for her. Once again as I looked down at her beautiful face, my feelings of broodiness returned. In October two of my friends gave birth to little boys. My best friend is due to give birth to her son later this month. There seems to be something in the water lately but I guess that’s what happens when you get into your thirties – everyone’s life course is changing. Cocktails are swapped for nappies and bottles. I have to ask myself am I ready for that change? On the one hand, I have always wanted a baby and the biological clock is ticking. On the other hand though, I am enjoying seeing the world and splashing out on the latest fashions, especially enhancing my shoe collection! There is no doubt that having a baby changes your life and your priorities. Suddenly that little bundle is all that matters, they come first and your needs are pushed to the back of the queue. Do I feel I have done all I want to do with my life and am I ready to hand over to children for the next 18 years? It is a massive commitment and one which one should not enter into lightly, however if you wait until you are ready, is one ever ready? There is of course another issue; we all take for granted that we will be able to have children – that is of course by no means a certainty and until you start trying, you won’t know. Anyway I guess you are wondering, what the old is that I refer to in the title of this post? Also at the end of September, I had my first experience of a lunar cinema. This is an outdoor screening of a film – I guess kind of like an American drive through but without the cars. Rochester castle was the venue. Rochester castle is a stunning medieval keep which is 125 feet tall. The historic town of Rochester has a fascinating history and was a favourite of Charles Dickens. The Pickwick Papers and Great Expectations have references to the town. The castle – lit up against the night sky provided the perfect backdrop for the screening. They were showing the much acclaimed 1986 film, Top Gun. I love this film and have seen it many times but never on the big screen. Tom Cruise for me was in his prime at the time of this and Cocktail, pre scientology. 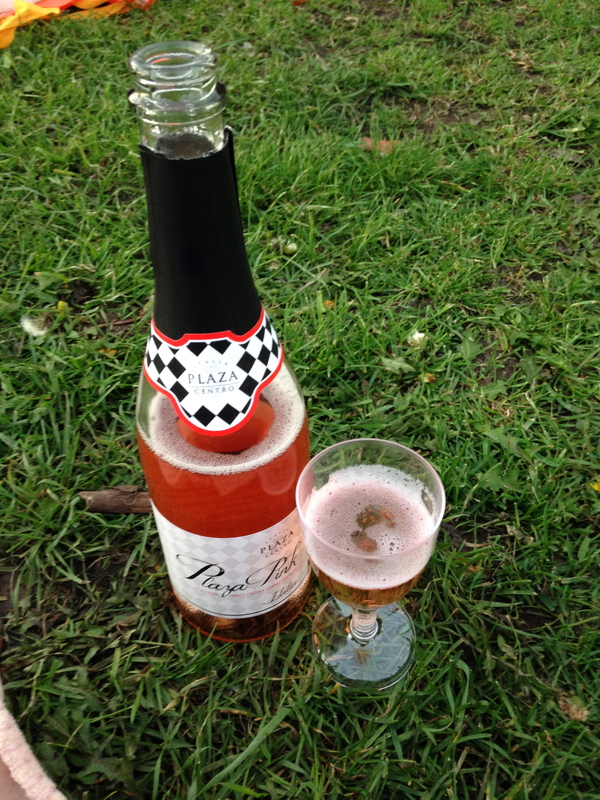 We laid out a blanket to mark our spot on the grass and as the film opening credits were rolling, opened our bottle of rose Prosecco. 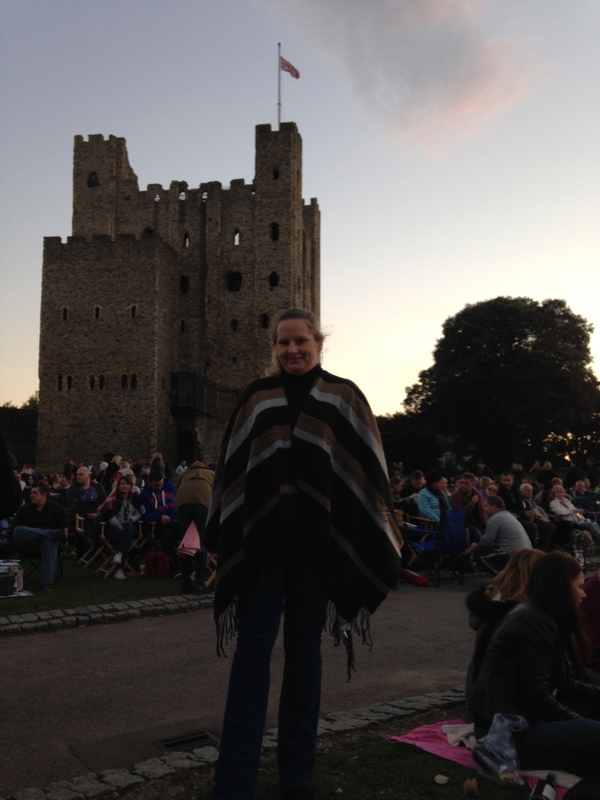 Despite it being fairly warm still in September I can report that it was pretty cold as the night drew in and I was glad of my new blanket wrap, an autumn trend, which I bought from Jane Norman. Another trend seen on autumn’s Prada catwalk was the Prada ponytail which I also tried out for this occasion. Essentially the hair is pulled into a high ponytail and a piece of hair wrapped around to hide the hairband. The ponytail is then clipped to the side with a pretty barrette. After the film we warmed ourselves up with a curry. Whilst we are on the subject of old and new we should be moving house tomorrow so unfortunately blogging will have to take a bit of a back seat as I concentrate on packing and unpacking boxes. I would love to know which autumn/winter fashions you are loving as well as any advice on the should I, should I not baby question. Until next time……….